TOPIC: Reasons why you may not have an attorney abound. 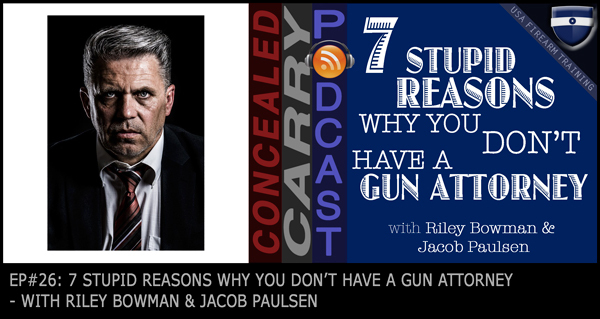 Today we hash through a few of the most common things we hear about this important topic. Do u have gun lawyers registers with ur organiztion. Yes or No. Second Call Defence is an organization that you can call after an incident and they will find an attorney in your area anywhere in the US. Great for those of us who travel extensively. They cover the attorney’s retainer, bail money for you, legal defense costs, as well as some great training info. I used to be a member of USCCA but it was a bit too expensive to cover both my wife and me. Now I have the family platinum package from Second Call Defense for less. One call and everything is covered. Much easier than trying to find a lawyer in each state you travel to. Great podcast. I’m new to your podcast, so I’m still a bit behind on listening. I am having trouble downloading the lawyer phone call checklist. I’ve given my info but I didn’t get an email yet. Thanks for your work. It is appreciated!